Recruitment 2018. 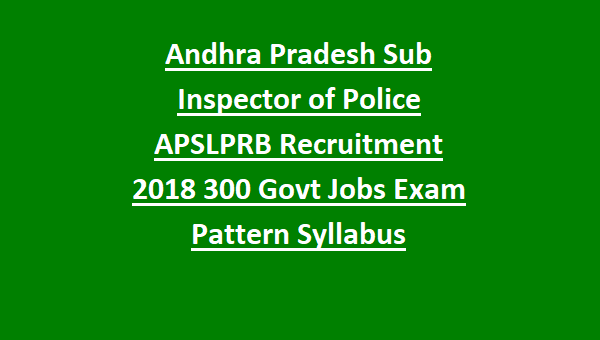 Interested and necessary physical standards having candidates can apply online for this APSLPRB Sub Inspector of AP Police jobs through APSLPRB official website or recruitment.appolice.gov.in. APSLPRB online application link will be active on 05-11-2018 and last date to apply online for this APSLPRB Sub Inspector of Police Civil AR APSP jobs is 24-11-2018. Selection for these AP Police SI vacancies will be based on prelims written exam, Physical Tests and Mains Exam. 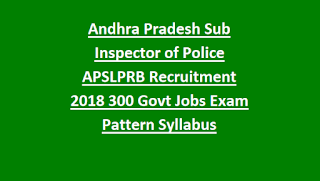 In this APSLPRB notification we are also providing the exam pattern and syllabus details for this AP Police Sub Inspector jobs recruitment of APSLPRB. Exam date, admit care release date, physical tests details, selection process, and other details of this Sub Inspector of Police APSLPRB recruitment is given below. There are total 300 posts in this APSLPRB SI Recruitment 2018. Candidates must have qualified Degree from any one of the recognized university approved college. As on 01-07-2018 age limits are 21-25 years for this AP Police SI Jobs recruitment of APSLPRB. For reserved candidates upper age limit is 30 years. Candidates selection for this AP Police SI recruitment will be based on various stages. Preliminary exam will be conducted for 200 marks. All the questions are objective type only. SI Prelims exam consists of 2 papers. Online applications only accepted for this APSLPRB Sub Inspector of Police recruitment. Official website to apply online is recruitment.appolice.gov.in. AP SI Jobs exam pattern and syllabus, previous question papers, exam key, SI Exam Date, SI Exam Admit card release date, physical test details and other details are given in this website only.